This topic seems to have been discussed very little here. I am trying to ascertain the right settings to shoot my own negatives with a large format camera. Particularly the lighting and the developer. I have had a small amount of success in the past making small negatives with a 4x5 camera but the negatives were slightly cloudy were meant to be clear. Lately i modified an Artiscope camera to use as a process camera. I ground the glass with sillicon carbide in 400 and 600 grit to be able to use as a focusing screen. This worked well but i have now realised that i must take off the glass before exposure or the negatives come out foggy. I have 3 light sources of 1000watts each. i have exposed the film for a range of times such 3, 9, 16 sec, and 2, 4, 6, min. I am using PQ Ilford developer, not the two part one i think it is called A and B high contrast. However the film recommendations suggested PQ would work. the result i am getting: cloudy areas were it should be totally clear. What kind of film are you using? Also, there are plenty of cheap process cameras out there right now. Nobody knows what to do with them. The best way to make a proper ground glass is to etch it with hydrofluoric acid. This is the formula I use for ortho film…..
Mixing Instructions: Add chemicals in specified sequence. When mixing due to the risk of heat reaction dilute sodium hydroxide separately in a small amount of cold water then stir into mixture slowly in sequence. Usage: Starting point dev time: 2 mins. Thank you for your comments Smokeynewton. I am using MACO GENIUS PRINT film. What film do you use? is currently available on the market? The cloudy areas could be due to incomplete “fixing” after development. I used to run a Robertson 20” x 24” process camera back in the 70’s, we would start our exposures a f22 for 20 seconds, develop in rapid access lith chemistry for about 35-40 seconds at 85 degrees then let the neg sit in a bath of fixer until clear. We did later get a film processor which was much easier. The cloudy areas could also be due to the film not having high enough contrast, and those areas are slightly exposed. If you do succeed in getting the areas to clear, you may find that the film density isn’t high enough for plate-making. The regular lith film is quite dense — you should not be able to see any light, except maybe the filament dimly, when you look at a clear glass light bulb through it. Get yourself a step wedge and use that to determine the correct exposure. I believe a clear step 7 is about right, if I remember right from 25 years back. Thanks Jim, i’ll see what happens if i leave it longer in the fixer. I didn’t think that the fixer would clean the neg further. Thanks Bob, the film is very dense at 3min development. Just as dense as the processed negatives i pay for. How do i use the wedge? should i photograph the wedge with white paper under it using the same light conditions? what is the difference between half tone, continues tone and lith film? also what do you think of my light source? do i need more wattage? The 12 step 1/2” X 5” one is the one we used to use. Every time you do a camera shot, you put the gray scale on the copyboard of the camera, with your art, in a place where it will show up on the negative. Lith ortho film is ultra high contrast. When the film is in the developer, the steps on the grayscale won’t all develop at once and look like the steps on the grayscale. What will happen is that first step one will turn black, and then step 2 will turn black, and so on. With this grayscale, as I remember it, when step 4 turns black, you take the film out and put it in stop bath to stop the action of the developer, (or directly in the fixer if you don’t have stop bath). If you have fine lines in your art, and for instance you pull the film out after step 3 comes up black, the lines will be wider. If you pull the film out after step 4, they will be about the same as on the art. If you wait until step five turns black, the lines on the film will be narrower than the lines on your art. So, you can play around with the time the film is in the developer to get the correct line thickness and reproduce the art faithfully. What “ortho” means, by the way, is that the film is blue sensitive and red blind (not exposed by red light). This is why you can use a red safelight with ortho film. Since the film is blue sensitive, you can write instructions to the camera operator (or yourself) in light blue pencil, right on the art, and it won’t show up on the neg, because the film sees light blue and white as the same. I don’t know if they still do, but they used to make “non-repro blue” pencils for this purpose. It’s probably been 20+ years since I’ve done this, so if anyone sees any mistakes in my write-up, please jump in. Regarding continuous tone and halftone, continuous tone is like a black and white photograph, where there actually are many different shades of gray in the photo. These shades of gray can also slowly change to get darker or lighter depending on what is in the photograph. We printers cannot print continuous tone because we cannot print varying shades of gray. If we put ink on the sheet, it is black. If we don’t put ink on the sheet, it is white. There is no in-between. So, as printers, we have devised the halftone process, to make the viewer think we are printing shades of gray, when we actually aren’t. What we do is to print different sizes of dots, which are usually so small that the viewer doesn’t even notice them. Then when we want to print a light gray, we print tiny dots with lots of white paper between them. When we want to print darker gray, we brint bigger dots with less white paper between them. And when we want to print dark gray, we print even bigger dots with even less white paper between them. We can also continuously vary the sizes of the dots to get gradually changing shades of gray. If you look at most any black and white picture in a magazine, with a magnifying glass, you can see the dots. I am always blown away by the knowledge people like you folks share here and the time you devote to explain things. Thank you for taking your time to write comments with such detail. I am taking it all in. There is lots here that i need to diggest. I know it is a bit silly, but i am conviced that ortho film is the way to go. I thought it would be easier to be honest. Some swear by inkjet and laser but i just want to give this a chance untill i trully come to a dead end. Here’s a source for high contrast lith film that is still being sold. Note that they can also supply the appropriate developer. In some cases you will be able to shoot through the base of some of these films to obtain RREU negatives directly in the camera, better than exposing the plate through the base, but you’d have to experiment. We used to use a duplicating film to obtain RREU negatives from conventional lith negatives (RRED). I don’t see any duplicating film on the freestyle website, but perhaps it is still available somewhere. You also can produce positives via inkjet and contact them to lith film to get the high density film for plate exposure. The main problems with shooting through the back of the film are having to reset the focus to account for the thickness of the film, and having to shoot through the anti-halation layer that’s between the emulsion and the base. It can be done, but it’s not a very good method for producing high quality negatives. I doubt that anyone is still producing duplicating film anymore, but I have not searched for it so I can’t really say. It IS possible to use direct-positive developing. It’s almost like magic that it works at all but it does work. It consists of developing the film but not fixing it. The exposed areas are then removed by using a bleach consisting of potassium dichromate and sulfuric acid that removes the exposed areas leaving behind the unexposed emulsion. The film is then re-exposed to room light and developed again before fixing. That would give you a negative from a negative if you wanted to contact it to reverse the image and might be an option for someone who’s only producing negatives occasionally, and cannot find duplicating film. It’s a cool trick but uses some harsh chemicals which present problems of their own. Also, contacting doubles the amount of film you consume, and we all know film isn’t cheap. If the only negatives you intend to make are for letterpress plates, you would be better off to alter your camera so it’s dedicated to that purpose, or try and locate an old photostat camera. 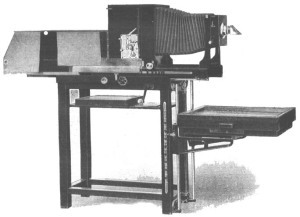 Photostat cameras were set up to shoot on paper and come with a prism built in. It all may sound a bit daunting, but it’s really not. Once you have the proper equipment and the right materials, making negatives is a fairly straightforward and routine process. This is typical photostat camera for shooting right-reading images so you know what they look like. The boxes on the back were for room-light operation so they’re not needed for darkroom use. I believe if you go to http://tinyurl.com/l9ov8s9 you will find what you need to make your negatives with. This is the same materials I use to use. Valley Litho also has the dupe film. -Hope this helps. The Stouffer scale in the tinyurl link above is a transmission scale for platemaking. The one I talked about in my post farther up, is a reflection scale for use on the copyboard of a process camera. They are two different products. Sorry, thought he was wanting info on making pp plates. Want your very own BIG horizontal process camera, the kind where the film board is built into the darkroom wall and the bellows, lens, lights and copyboard are in another room, and which even comes with film, chemistry, etc.? Just put Robertson 320 into ebay’s search box, and it will come up. But you’ll have to hurry…..only about 17 hours left. Have fun!!!!! And it’s certainly the right price….$0.99 at the moment. Winfred Reed, no problem. In fact, your tinyurl link will be helpful to a lot of platemakers, especially those just starting out. It’s good you posted it. The Robertson won’t give him what he needs unless he’s making plates for offset. He’ll still have the same problem with the emulsion on the wrong side for any kind of relief plate. Winfred Reed: Good link. I’m glad to see that someone is still selling dupe film. Thanks! I managed to find a big box of AFGA Copyproof system film and papers with the processor for $10!. I have been reading about it and some are designed for purpose of image reversal. I know, i am pretty lucky! Some of the techniques mentioned here are very interesting. John Henry, the inkjet to ortho film you talk about, is that by printing on to transparency and then direct contact exposing it to lith film via room light? Or else what do you mean by “contact them”? I had never heard of a Photostat. Will inverstigate further on that. Yes, the camera is only for making negs for pp plates. Just on the same note, would reversing the image on the computer then printing a good quality original and shooting it normally on the camera work? I am in Australia. A bit far for large purchases but thanks anyway for the heads up! The CopyProof material is useless (except for silver recovery of the negative sheets). Diffusion Transfer chemistry has not been available for over a decade, so even if you find a some it will be spent. When Agfa CopyProof and Kodak PMT were discontinued, there was a third-party chemistry available, but by the time I found the web pages listing it, it was also discontinued. Yes, flopping digital output will allow you to get a RR/E-up neg, and outputting at a larger size and reducing it on camera will give you a higher effective resolution. Regarding halftone film, it is not too suitable for relief photopolymer because it has soft edges to the image to allow for chemical dot-etching. Lith line film is preferable; Rapid Access is common but doesn’t perform well with tray development: thin density and pinholes. I’ve been using a hybrid rapid access film called Pressline HD from Kelly Paper in the US (not sure if HD is for High Definition or Hard Dot or something else) which has a long-life single-solution developer. The only problem is that it doesn’t shoot well through the back for image reversal, so for fine detail I have to do a contact dupe neg. Don’t know if THAT will be available when I run out of current stock. smokeynewton, I’m just wondering exactly how we did make negs for photopolymer when we had the process camera. I remember most of it, but not all the details. We shot lith film on the camera, ran it through the processor, and then I guess we contacted it (with daylight film under yellow lights, using a point light source and a contact frame). But we always ended up with matte finish film to make the plates with, as I recall, to get a better vacuum in the plate exposure unit. In those days Dupont made different types of film and we used Dupont products quite a lot. This was at a technical college I taught at, and we used the photopolymer plates for masters to make bakelite molds from, for rubber plates for flexo. I remember we had contact film, which was negative working like lith film, but we also had dupe film (for contacting), which was positive working. It seems I remember that one of the types of film did not have enough density for platemaking, and we had to make a copy (or dupe it), because the type of film we then ended up with, did have the required density. Maybe we just used the dupe film for spreads and chokes…..
Maybe some of you can sort this out, if it is even worth sorting out….. I worked for a typesetting company where almost everything we did was pre-press. We had several horizontals (Robertson, Brown, etc.) and they were all used primarily for making negatives for offset. If we had to make negatives for engravings we either contacted it to dupe film or shot it on an old photostat camera that we normally used for making reverses for paste-ups. There were some fancy and expensive prism and mirror attachments for some horizontals (Klimsch comes to mind) that reversed the image directly at the lens board, but we didn’t have one at our shop. I think they had one at our sister plant in another state but I never used it. Either way, no matter how you get there, offset and letterpress plates and engravings need two different types of negatives or the quality will crash and burn. PHOTOSTAT was originally a trademark for a particular company and the camera that they produced. It eventually evolved into a generic name for a type of process. In the days before Xerox, if you needed a quick copy of a document it would have been shot on a photostat camera that produced a right-reading image; hence the prism. Instead of film one would use print paper and the result would be a right-reading paper negative print; a one-shot method for copying. You’ve probably seen those old copies of birth certificates, marriage licenses, etc., that were white type on a black background. Those are photostats, or just “stats” as they came to be known. They were quick and cheap to make. They were ultimately replaced by Xerox machines. However, some of those old cameras are still lurking out there in garages and storehouses and they are perfect for making negatives for letterpress plates and engravings. The added bonus is that if you can locate one it will most likely be dirt cheap (unless you have to ship it halfway around the world). I’m also quite sure that they made photostats in Australia at one time so look around. You never know; there might be one nearby looking for a new life. There was a Kenro camera not long ago and i missed it. I have only seen about 3, in other states as it always happens, in the past 2 years. Probably no one thinks anyone would want to buy them. I will keep looking but in the meantime i will give it a go at the HC developer and the step wedge first. Kenro cameras are verticals, but they work exactly the same as a horizontal. I had a Kenro Vertical 240 in my garage shop for years but finally got rid of it. There was a neat little aftermarket mirror device that sat on the copyboard to reverse the image but it was pretty limited as to the size of the original you could put into it. I wanted a camera that could be used to shoot either type of negative so I converted an old wooden Century enlarging camera, but I was fortunate enough to have a couple of the old prisms left over from the old days. I still see the prism attachments pop up on ebay occasionally but you could do the same thing with a small (4”-5” square) front-surface mirror set at a 45 degree angle in front of the lens. I’m glad to finally see some discussion of Camera / Darkroom work going on here! The last time i posted anything about making negatives here, I got told that the endeavor was obsolete, non-productive, too complicated for mere mortals, and only old fossils like myself still practiced the Dark Arts. As a result, I stopped discussing it here, but still kept right on making my own negatives. So…. THANK YOU to all of the folks now discussing the techniques again. Anyway, back to the discussion: I use Arista and/or Ekfe ortho film for my line work, and both of them produce excellent high-contrast negatives. I get it from the Freestyle web-site mentioned above…. and their site does indeed make good recommendations about developers and so forth. if you follow their guidance, you won’t go wrong. Now… about cameras and so forth. Depending on the size of your images, you may or may not need a full sized graphics art camera. I do a lot of my smaller work using a 4x5 view camera that I got off of eBay for a very low price. Like all film-related cameras, there is less demand for them nowadays…. so the prices are low(-ish). Go back up and study SmokeyNewton’s attachment…. It pretty well shows you how you have to set up a view camera in relation to it’s copy-board to make the correct orientation of negatives. Absolutely! That’s a clever way around the problem. If your original is reversed to begin with then yes, you would get what you need in the end. Good thinking! Thanks winking cat press, sometimes it feels like your the last man on earth doing stuff that everyone else has abandoned, but then you see that there ARE others out there. I remember that back-in-the-day the quality of type was everything. Typesetting companies built their reputations around the high quality of their type, and charged accordingly. Then along came desktop publishing, and even though the quality was horrible in the beginning, customers embraced it because it was cheap and they could do it themselves. It’s funny how quality was no longer the most important thing when it became quick and cheap. Negatives are sort of like that now. Speaking of typesetting, in the 70’s I worked for a large packaging company and they got their type repro proofs from Perfection Type in Minneapolis (or St. Paul?) as I recall. Lots of copy for food ingredients, among other things. It was on proof paper with a beautiful matte coated finish and the back was light green (or some was yellow I think). I bet you can’t get that paper any more. There was one person in the art department who was occupied with that job full time. Geoffrey, that repro stock was called releon. Probably the wrong way to spell it! Pronounced “rely on”. Great reproduction quality. Thanks James! I used to have a small stack of it, but no more. Small world Geoffrey, we also used “Rely-on” (I never knew how to spell it either). We pulled most of our repros on Krome-Kote for paste-ups, but the good stuff we pulled on Rely-on. Your right; it had an amazing matte surface (a clay coated paper I think) and gave beautiful repros. I tried to search for it but…..nothing. I need to keep trying with the Kodak D-8 developer as i still have not got good results with it. with Ilford PQ I managed get fair results. Here are the photos of Stouffer scale. the second copy seems to be the closest to step 4. It took 3 min. Merry Christmas Briar Press friends! Thanks for the pictures of your developed gray scales. That Ilford PQ film must not be as high contrast as what we used to use. Your developed scales look like they go from black, through about 5 steps which are at various stages of development, and then to white. I think our developed scales only had 2, or maybe 3, steps between black and white. However, it looks like you have become familiar with the Ilford film, and if you can get the desired results with it, and reproducible results with it, great. Merry Christmas to you as well, and thanks for updating us on your progress. Any time you would like to post more progress reports, I would welcome them.